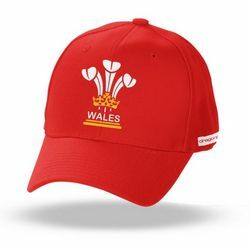 Brinley Williamss own designer collection of Wales & Cymru cap are available in a range of colours for both adults and kids are sure to go down well given how popular caps are today. Available in either black or red these caps are multi directional so can be worn with the peak facing the front or for the uber cool look - reversed so that the peak is at the back. Please be aware that there is a age restriction on wearing the welsh caps in a reverse peak position. Although not officially recognised we suggest anyone over 30 does not adopt this super cool look as it seems to have the opposite effect. As always, if you have any questions about our welsh baseball caps please feel free to drop us an email using the contact us link at the bottom of the website. Finally, if you would like to create your own bespoke welsh peak cap design we would be happy to work with you so please get in touch. However please note, that we can only offer a bespoke service for order over 100 units.